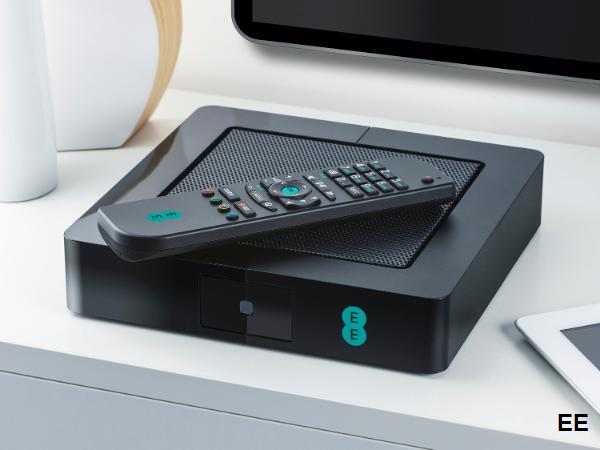 EE has become the latest telecoms operator to launch its own TV service that offers additional connected TV content on top of Freeview channels. The EE TV smart PVR box is to offer access to Freeview and Freeview HD channels available through a normal TV aerial alongside on-demand and catch-up TV services delivered via broadband internet. Freeview channel availability is subject to local coverage. While services such as Sky's Now TV aren't available, it has been confirmed that YouTube and Wuaki.tv are supported. It has four HD tuners allowing viewers to record or watch 4 different channels simultaneously and 1TB of storage for recordings and allowing users to pause and rewind live TV. The box is also kitted with dual Wi-Fi and users with smartphones will be able to use their phone as a remote control or to use as a smaller viewing screen to which the EE TV box will stream content. Flick: Move something you're watching in the app on your smartphone or tablet to your TV screen via a simple flick of your finger. Restart: Missed the start of your favourite programme? Use restart to go back to the beginning. Touch control: Use your android or iOS smartphone to control the EE box. The move by EE to launch this service, which in effect combines the functionality of a Smart TV with the storage of a high-spec Freeview+HD box, comes as EE continues its attempt to take a larger slice of the home broadband market and acts a sweetner to encourage EE customers to stay with the service, rather than being tempted by offers from BT, TalkTalk, Virgin Media and Sky, who all offer TV packages bundled with their home broadband service. The EE TV box is to be made available to EE home broadband subscribers for free. Non-EE customers will not be able to use the box - it's designed to only work with an EE internet connection. EE says the box will be available to customers "soon".